Hello, Sue Fliess! Thank you for returning to Watch. Connect. Read. to share The Earth Gives More’s cover. What are three things you want EVERYONE to know about The Earth Gives More? 1. This book is a love letter to Mother Earth and how unwavering she is, despite what we are doing to her. Not to get too dramatic, but I just read that we essentially have 11 years to correct our ways in order to prevent global warming from passing the 1.5 Celsius mark—which is sort of the point of no return. I mean, where else are we going to live? We can’t all fit in (or afford!) Elon Musk’s Mars rocket, now can we? 2. Right now, things feel crazy and unraveled to me. So, writing this book was a way of grounding me; of reminding me that there is still good in the world and so much to enjoy right at our fingertips, or just a step away. There is still clean air, nature, and sunshine around me. Writing and revising it gave me a sense of calm. 3. This book is a reminder that we need the earth as much as the earth needs us. That it has to be a give and take, we can’t just keep taking, or there’ll be no more for her to give. If that sounds corny, we need only think about what we get from trees. Without them, we’d quite literally be out of breath. Wow, anyone who knows me knows I’m not usually this serious! I don’t believe I set out for this book to send a stewardship message, but now I can only hope it reminds people of what we’d be giving up, of the price we’ll all pay, should we decide to ignore Earth’s pleas for help. Christiane Engel’s illustrations are light-hearted and thoughtful, colorful and uniquely beautiful, and express the inclusive feeling I wanted the story to convey—that the Earth is here for everyone to enjoy if we do our part. My favorite illustration is of the mother and her daughter camping with their dog under the stars. So pretty. 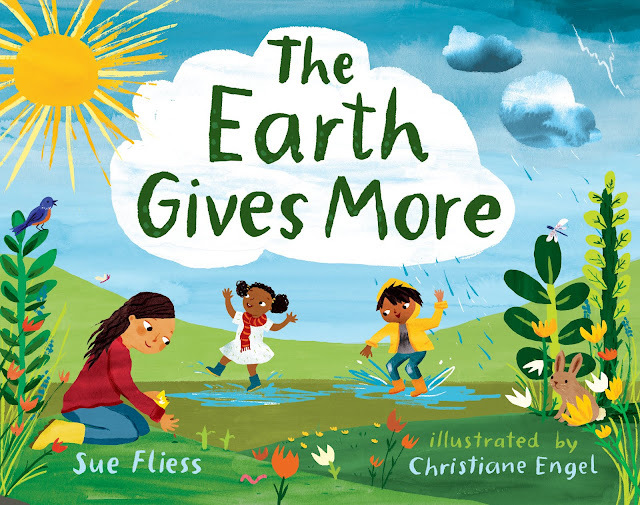 On March 1, 2019, The Earth Gives More (Albert Whitman & Co.) will be available everywhere books are sold! I really hope readers love it. Did you know I dedicated this book to my sister Christine, because I drew from our childhood experiences when writing most of the activities in the story—ice skating, sledding, playing in the ocean, cleaning up the beach, camping, and jumping in leaves? In fact, I just went on a hike in the Arizona desert with her! Story is what we do every day. Story is vital to our survival. We are constantly writing our stories as we live out our lives. We all have stories and we all seek listeners to hear and understand them. Look for The Earth Gives More on March 1, 2019.